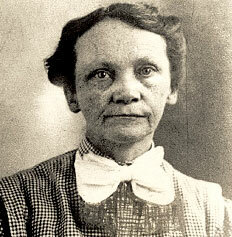 Serial killer, Amy Archer-Gilligan was also known as "Sister" was born in October 1873 and died on April 23, 1962. Amy owned Archer Home for the Elderly and Infirm nursing home in Windsor, Connecticut where she murdered at least five people with poison including her second husband, Michael Gilligan. It is believed that she was involved in more deaths, but that is not proven although there were 48 deaths in her nursing home. Amy was born in October 1873 to parents James Duggan and Mary Kennedy in Milton, Connecticut and was given the birth name Amy E. Duggan. Amy was the eighth of ten children to be born to Mary and James and attended Milton School and the New Britain Normal School in the 1890s. She married James Archer in 1897 and gave birth to their daughter, Mary J. Archer in December 1897. Amy and James moved into elderly widower John Seymour home in Newington, Connecticut to become the caretaker in 1901, but he died a few years later in 1904. John heirs converted his house into a nursing/boarding house for older adults, and the Archers were allowed to stay and care for the elderly at a cost. The house was sold in 1907 resulting in the Archers moving to Windsor, Connecticut where they purchased their own residence and converted it into their nursing home business called, Archer Home for the Elderly and Infirm. James Archer died in 1910 from Bright"s disease, also known as kidney diseases but his death worked for Amy"s benefit because she took out an insurance policy on John a few weeks before he died. Amy was able to keep the nursing home running, and that is due to the insurance policy payout. Amy married again in 1913 to Michael W. Gilligan who was a wealthy widower with four grown sons and was interested in investing in the nursing home. Michael"s life came to a tragic end on February 20, 1914, after only being married to Amy for three months. He died from an acute bilious attack which is also known as severe indigestion. Amy was pleased because Michael left his entire estate to her in his will but the will was later discovered to be a forgery as it was written in Amy"s handwriting. There were 60 deaths in the Archer Home (Amy"s nursing home) from 1907 to 1917, and only 12 nursing home residents died from 1907 to 1910. There was a total of 48 nursing home residents that died from 1911 to 1916. Suspicions grew when the number of deaths was known to family members and also when Franklin R. Andrews who was a healthy man died on May 29, 1914, from being sick for one day but his cause of death was from a gastric ulcer. It was discovered that many of the residences died after giving Amy a huge amount of money or naming her in their will. Franklin R. Andrews relative, Nellie Pierce reported her suspicions to the police but was ignored so she went to newspaper company The Hartford Courant and her story was published on May 9, 1916. The article was titled "Murder Factory" which led the police to take the matter seriously and start their investigation which took about a year. Michael W. Gilligan, Franklin R. Andrews, and three other residents body were exhumed, and it showed that all five were poisoned with arsenic or strychnine. Merchants said that Amy was buying massive amounts of arsenic to "kill rats." Amy was arrested and convicted after records proved that Amy was sending her patients/residents to purchase a significant amount of arsenic from the drugstore. She was initially tried for five counts of murder, but her lawyer was able to reduce the amount to one count of murder, Franklin R. Andrews. She was sentenced to death on June 18, 1917, but she appealed, and a new trial was set for the year 1919. She pleaded insanity in 1919, and her daughter testified that her mother was addicted to morphine, so she was convicted of murder and sentenced to life in prison. Amy was declared to be insane in 1924 and was sent to Connecticut Hospital for the Insane in Middletown. She stayed there until she died at age 88 on April 23, 1962. Amy Archer-Gilligan serial killer is a male serial killer. Amy Duggan "Sister" Archer-Gilligan is a male serial killer.